I was meandering through the internet, and came across the US DOE fuel economy website. There you can get a list of fuel economy by class, or you can select the "Cars that don't need gasoline" link and get a list of economies for flex-fuel vehicles. For instance, select the Ethanol-Gasoline vehicles type and you'll find something interesting - the E85 vehicles get significantly worse economy than their gasoline counterparts. Their air pollution scores seem about the same in all cases (although the gasoline vehicles have a slightly higher "carbon footprint"). In fact, the only really cool thing about the E85 vehicles I've found comes from this article about a 1998 Ford Taurus flex-fuel vehicle - the E85 powered version was quicker (acceleration) than the gasoline powered version, which is the only stat that really concerns me. Of course, in a car like a Taurus, who cares, anyway? :) Back to the emissions thing... yes, lower CO2 from the E85 version, about 11% less, but about 31% more CO, and 33% more NOx. And the study reported at this site says that annual deaths will increase from the use of E85 instead of gasoline (cool, eh?). 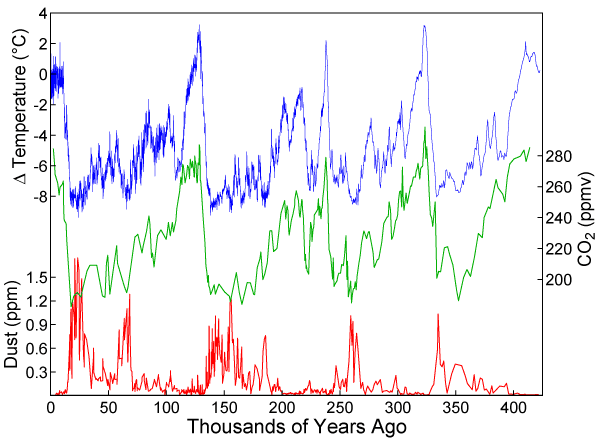 And what about the ice-age scare in the 70s? Take a look at this picture from Nationa l Geographic. 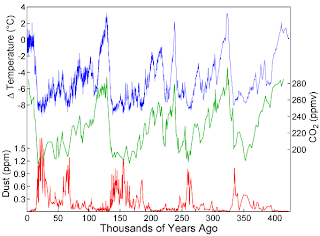 Or consider the image over to your right, showing dust, CO2, and temperature over the last 400 thousand years (now, where they got the thermometer readings over all that time I'm not quite sure...). Seems like it's quite cyclical to me. And consider the point made on this page: extrapolating data from short trends is not a good idea, and we really don't have any "long trends" as far as global climate change is concerned. We're constantly improving our measurement devices; how can we use modern methods to compare with old methods?